When an alien spacecraft crashes into Central City, Barry calls on his friends for help in stopping the alien invasion. But secrets between team members create dissension among the group. Can I just say everything? Okay, there were a few things I didn't like, but that's because somebody is being a meanie pants. But overall, this episode was epic. Here's why. The greatest thing about these crossover events are when all the characters come together again. I loved seeing the characters interact. It was precious. Cisco and Ray fanboying over technology was perfect. Felicity talking to Cisco about Barry was touching and also sad. I love watching them work together to solve problems, though. Stein and Caitlin reuniting was so adorable. I love that Stein was giving Caitlin advice about her powers. It was fun to see characters get updates on each other's lives. Iris learning Oliver Queen is the Green Arrow and calling him hot in front of Barry was perfect. Mick talking to Kara was hilarious. His comments are always funny, and Kara's reaction was spot-on. On Legends of Tomorrow, Stein has been having weird memory flashes about another woman. Since he's in 2016, he decides to go get some answers, and he takes Caitlin with him. But what he learns is that he's not married to another woman, but he has a daughter! What?!? This is actually so exciting, and I'm so happy for him. I was so worried it was going to be something bad, but it's actually wonderful. I'm excited to learn why this has happened instead. I admire Iris for being so adamant about protecting her brother. Her best moment was slapping him after he got hurt. You go, girl. The scenes where everybody trained with Kara was adorably fun. She's so cute. I want more moments like this. While the aliens brainwashing most of the team is a bit cliche, it still worked well for a conflict. It was interesting to see Barry and Oliver take on everybody. 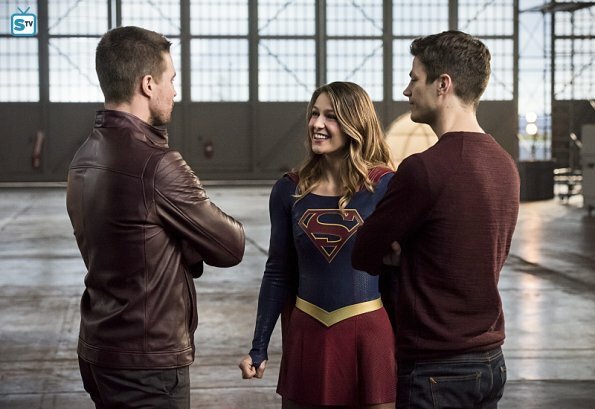 There were a lot of match-ups that I think we've all been waiting eagerly to see: Oliver vs. Sara, Barry vs. Kara. Wally's contribution of tripping some of them was great as well. A+ writers. The special effects of this episode were spectacular. Seriously, just go watch it for that because wow, it was cool. The aliens are super creepy looking, and I don't like them. I also don't know what they want or why they killed (?!?!?) the president for no reason. I'm scared, but I know our heroes can do it. I love seeing Wally happy because of his powers; he's an adorable guy. But I hate that nobody is willing to trust him. If they would just let him train, especially with Barry and Kara around, then he probably wouldn't have run out there and gotten himself hurt. If they would trust him, they could protect him--like they did with Jesse. But now, he's going to train with HR and that is not going to go well at all. It makes me so angry!! Cisco has really bothered me lately. I know he's mad about Barry and his brother dying, but he's being a complete jerk. I know you're sad, but seriously, Barry is your friend too. And I don't like seeing him this way. He was almost no fun in this episode because he's being so uptight. Watching Barry in this episode was really sad. He really beat himself up about Flashpoint. (Thank goodness Oliver was around.) To make matters worse the message from 2056 that Stein and Jax found doesn't help. He tells everybody the truth, but they don't trust him. He tries to be a leader, but he doesn't know how. In addition, he learns what happened to Snart. Poor Barry. Can I just give you a hug? The end was just: WHAT THE HECK JUST HAPPENED. People got "beamed" away. (What is this, Star Trek?) But where did they go? Why were they taken? Ahhh... I need answers. Overall, I love it. The crossover was so much fun. Can we do one of these every week? Please? No? Then more often than once a year? Maybe? I love the character interactions and seeing how everybody works together (or not). I'm stoked about the rest of the crossover event and what's next for The Flash. What did you think of "Invasion!"? What did you think of the first mega-super-ultra-awesomesauce team-up?